How are you ageing on the inside? At Lumia as you know we are all about you looking fabulous on the outside! However, you can only really look and feel your absolute best if you’re taking care of yourself from the inside out.. If you come along on the day you will get the unique chance to find out what’s going on in the inside. Lumia will be offering individual health scans on the day using the award winning technology of the Biophotonic Scanner. Don’t worry it’s not scary – all you have to do is place the palm of your hand in front of a low-energy blue light laser emitted by the BioPhotonic Scanner. 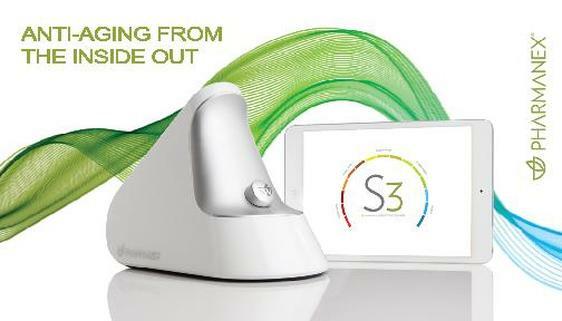 This Scanner can measure the presence and level of beneficial antioxidant nutrients in your body which can give you an immediate result of your health and wellbeing. Why Are Antioxidants So Important and Why Should I be Scanned? So antioxidants are really, really important for maintaining a healthy life and allowing you to look and feel your best. Ensuring a good amount of antioxidants in your diet can slow the ageing process, reduce the chances of cancer, lower high blood pressure, improve wrinkles and help your heart stay healthy amongst many other benefits. Their job is to fight ‘free-radicals’ which are the cause of many health problems and are produced due to stress, processed food, smoking, and if you think those factors don’t apply to you well, they’re even caused by UV light, pollution and being on your mobile phone. Don’t miss this unique opportunity..
We are delighted to have Susie Mollison, health and wellness expert who has 10 years experience working with the Biophotonic scanner. Susie will give a short group talk followed by individual health scans. Once you know your score you are empowered to make improvements through our advice on nutritional supplemenation and lifestyle changes. Our next event date will be announced soon. A nominal fee of £10 per scan is required.